On January 22nd, 2019, Ryozo Hanya, Resident Representative of JICA Chile, visited Instituto Fomento Pesquero (IFOP) which is one of the four core project management institutes in Chile for SATREPS MACH project (link). Mr. Hanya discussed the project overview and its strategies with Dr. Leonardo Guzmán (the Project Manager of MACH project), Dr. Oscar Espinoza (the head of Center for the Study of Harmful Algae (CREAN)), and Dr. Kyoko Yarimizu (a Japanese researcher from National Research Institute of Fisheries Science (NRIFS)). 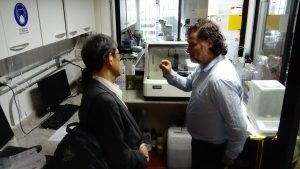 Dr. Guzmán and Dr. Espinoza gave Mr. Hanya a tour of CREAN facility which provided him depth knowledge of our project with respect to monitoring and analyses of harmful algae samples. Mr. Hanya commented that his visit of IFOP was fruitful and he understood importance of monitoring of harmful algae in Chile. Mr. Hanya also acknowledged significant contribution that has been made by Dr. Yarimizu to the project.